Throughout most of the 1980s, my family built cottages at my parents' tourist camp, about one each year. We constructed the foundations by digging holes about 0.8m (3 feet) deep and filling them with concrete. We then built a column on top of that either by forming concrete in a mold or by building it up with cinder blocks. This was quick and easy and worked well initially, but as we started realizing many years later, this method of building foundations can lead to long-term trouble with frost heaving. We hadn't anticipated that, as ground frost was never much of an issue in our native southern Germany. The problem is that successive cycles of frost heaving and thawing can leave the foundations permanently displaced from where they started out so that eventually, something needs to be done to straighten them out. The foundation at left, the worst in the whole camp, has worked itself out of the ground by about 30 cm, or one foot. 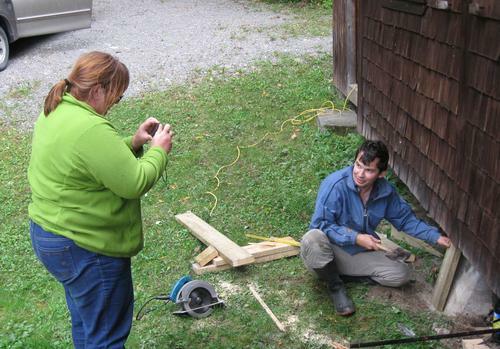 Recently, I was making some adjustments to the foundations for one of the cottages at the camp. 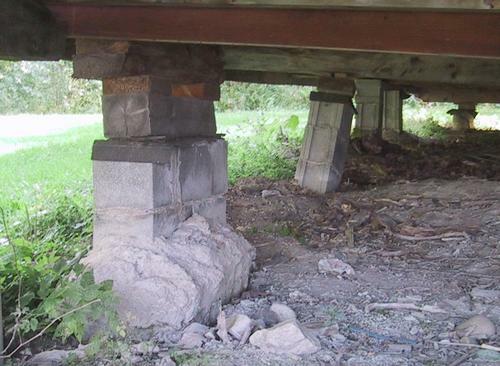 "Solving" the problem properly would require completely redoing the foundations. But that would be a huge amount of work, and it's unclear whether a new foundation would be the end of problems. In the meantime, the foundations as they are have lasted for 25 years, and only a minority of them have serious problems. So my approach is to brace it up where there are problems. Not a permanent solution, but a tiny fraction of the effort of redoing them. I figure with a little bit of attention every few years or so, these foundations should well hold up for another 25 years. My friend Tara was visiting at the time, and I used the opportunity to get her to take video of the procedure. Getting video is so much easier when you don't have to keep setting up a tripod for every shot. I edited together a YouTube video of the work on one of the foundations. The foundation in the video had mysteriously tilted inwards. Probably because it was subject to more frost heaving near the outside edge of the cottage, seeing that this is where the water from the roof drips down. I added a wooden support that braces against a ledge of the foundation. 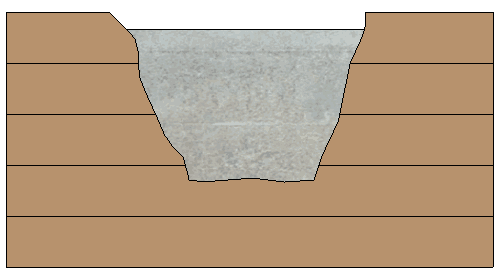 I figure with the load applied to that side, it will keep the foundation from turning further. And maybe, with luck, might even get that foundation to tilt back a little. I used pressure-treated lumber, which in my experience is quite good at resisting rot even when exposed to soil. The cottage with the worst foundations is cottage number seven, which is the one whose construction I wrote about in this article. This one is built on very soft clay, and the spot is low and flat, so the clay is often saturated with moisture. The foundations for that one started to seriously tilt, so I braced them on the side. I actually jacked up the cottage a bit before installing the braces, so that when I then let the cottage back down, the braces themselves actually took most of the weight of the cottage. So much so that the cottage didn't even touch the foundation itself. My hope is that with future cycles of frost heaving, the foundations will yield a little and maybe straighten out a bit. Ironically, the first three cottages we built have no foundation problems at all, but this is more a function of location than construction technique. So it wasn't until the later cottages were built, and many years on, that we realized this type of foundation can be problematic. Another tilted foundation. It is a bit mind boggling to see them tilt like that. One normally thinks of the ground as something that is, well, grounded. 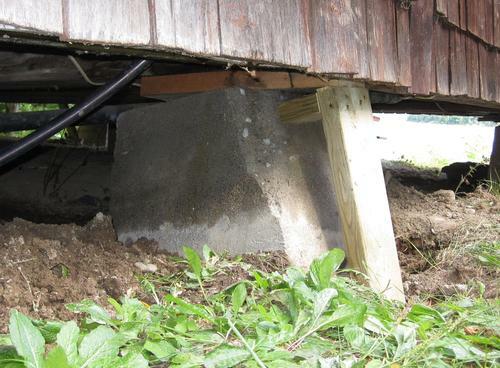 Occupied houses with basements don't have this problem because the heating of the house keeps the soil around the basement from freezing very much. But abandoned houses in Northern Ontario will typically have their basements pushed in from successive years of frost heaving. I made a video showing how frost heaving can cause a foundation to gradually lift out of the ground. If you can't watch the video, the illustrations and text below also show how it happens. We start with a foundation that was made by pouring cement into a hand dug hole. Were it not for frost issues, this would make for a good foundation, as the concrete foundation is directly in undisturbed soil. As the ground freezes, it starts freezing from the top. The frozen ground is much harder than the unfrozen ground, and locks the foundation in. 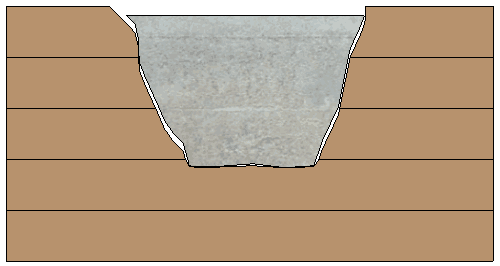 The foundation, on account of being tapered, is held by the top layers. 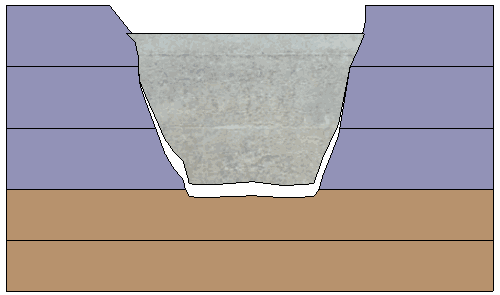 Now, as the freezing progresses downwards, the expansion of the soil below lifts the upper layers, which in turn pull the foundation up. 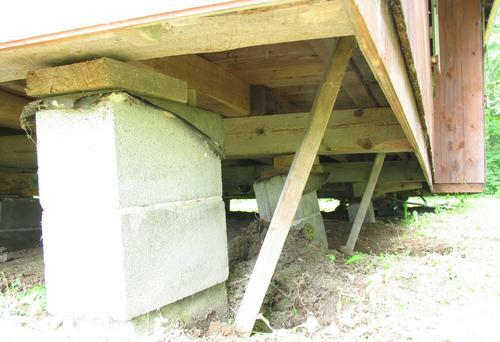 With the foundation lifted by the upper layers of soil it actually opens up some space underneath the foundation. Next the ground underneath the foundation shifts a little bit, partially filling the space that was opened up. The ground under the foundation is not frozen yet, so it will eventually creep to fill in the space. Once the ground thaws again, the foundation comes back down most of the way. But because the space under it partially filled in, it won't come down all the way to its original position. The displacement with each seasonal cycle is very subtle - maybe one centimeter or half an inch each year. Problems won't become apparent for many years, but over the course of decades, this can seriously throw a foundation out of whack. 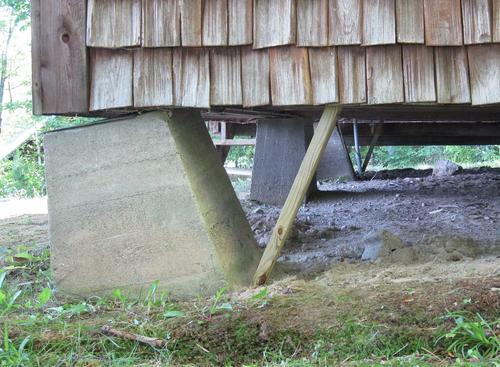 The foundation in this picture is by far the worst in the whole camp. It has climbed out of the ground by about 30 cm over the course of about 15 years. You can see the wider base of it emerging out of the ground. This is the same foundation as the first photo in this article. Here's another example of heaved posts. These at a rest stop facility along highway 17. The post were anchored in the ground by placing them in a hole and filling that hole with concrete. 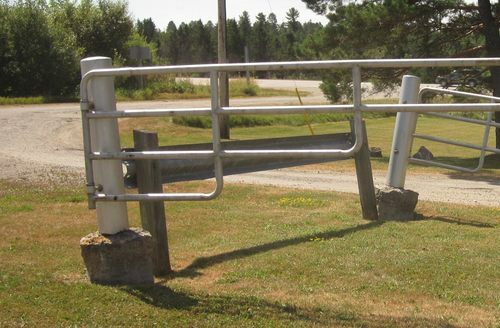 In frost prone areas, this always happens to posts anchored like that. 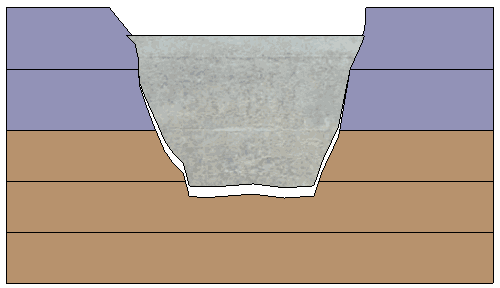 Foundation problems could have been much reduced by shaping the foundations to be wider at the bottom, with smooth sides. 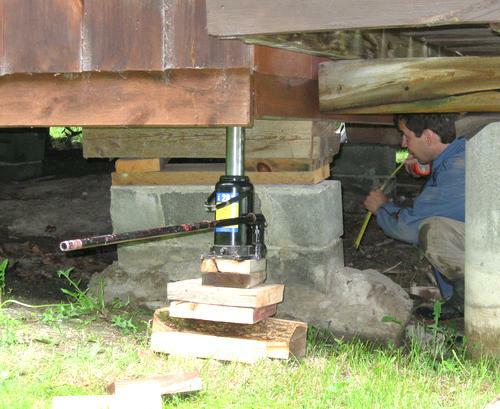 This would prevent upper layers of frost from being able to grab hold of the foundation and lift it out of the ground. 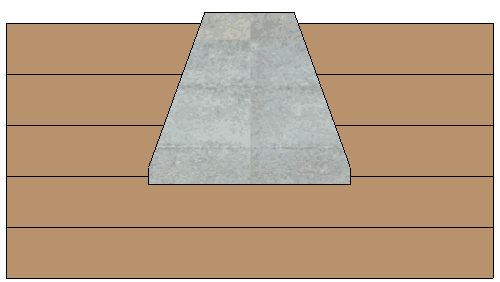 I think foundation shape is more important than getting below the frost line. Certainly, the way we did the foundations on the cottages, they'd be subject to frost heaving even if they went below the frost line. Digging a hole for a new foundation like this under an existing cottage would be very hard to do though. What I may end up doing eventually is to pull some of the foundations out entirely and just pour a small concrete pad on the ground as a replacement. This would be subject to no worse seasonal heaving than what is there now, but a pad that only sits on top of the ground would at least not be able to work itself out of the ground any further! Fortunately, my dad didn't use any drywall or interior plywood paneling in the cottages. So the shifting around doesn't result in damage to the interior walls. The biggest problem is that some of the windows end up sticking. The old cottages that we demolished were just built on top of beams that were laid straight on the ground. These of course eventually rotted, but at least they couldn't work their way out of the ground. Like most people, I used to think that frost heaving was largely caused by the 10% expansion of water in the soil as it freezes. But for a while this Wikipedia article on frost heaving linked to this page, so I read it. It turns out the bulk of frost heaving is caused by a phenomenon called "ice lensing". 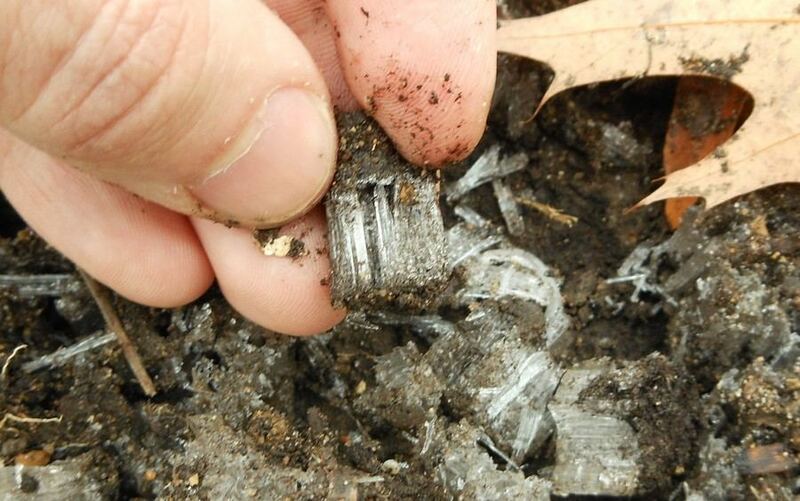 Ice lensing can result in far more than 10% expansion of the soil that water could explain. 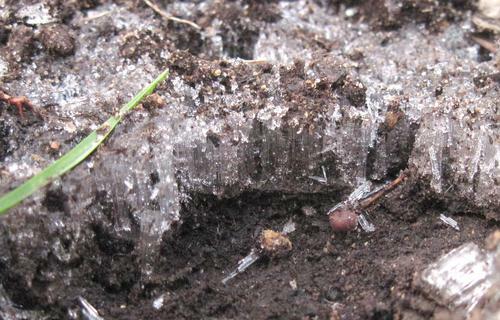 Ice lensing is the growth of whole layers of ice within the soil, characterized by long vertical crystals (click on image at left to enlarge). The ice forms at the edge of the frost, and as long as the soil below can wick more water to the frost line, the ice lens continues to grow in thickness. I had been wondering about this at times, often seeing 20 cm or more of heaving, which would have required the frost to penetrate 2 meters deep in soil mostly made of water if it was only the expansion of water that caused the heaving. I came across some ice lensing at the surface in my back yard while doing the last bit of leaf raking, so naturally, I took some photos, and made a short video of it too. These ice lenses were probably still growing because the soil below was still not frozen, and wet. Harmless at the surface, but if ice lenses grow within the soil, they can cause a lot of frost heaving.